Finally, I’ve gone back to the library after my self-imposed ban at the start of the Summer. I love the library, don’t get me wrong, but I really wanted to start whittling away at the stacks of ARCs and TBR books. If you saw the stacks you probably would think I didn’t make that much of a dent but I can squeeze in a few more books now so that’s a good sign. Anyway, since I wanted to find the book for my next mystery book group meeting I decided to see if the library and had it, and they did but I couldn’t leave with just one book, right? Here’s my little stack (and my mug) waiting for me to dig in this weekend. Lush Life by Richard Price. This is the October selection for my mystery group. A Deadly Paradise by Grace Brophy. I read the first entry in her Commissario Cenni series, which I really liked, and this is the second one. I can’t wait to travel back to Umbria to see what Cenni and his team will be up against this time. Unseen by Mari Jungstedt. I’m always up to try a new Scandinavian author and this one is by a Swedish author. I’m hoping I can start one this weekend although how much reading I get done will depend on when our family arrives. Anyway, what books are you reading this weekend? Any new mysteries? I hope you all have a wonderful weekend and more book talk soon. I hope to finish Baking Cakes in Kigali this weekend and then I want to start Olive Kitteridge. I also have a book about kids, play, and the media that I want to read so I guess my pile is pretty stacked. I just picked up two DVDs for the weekend at my library – The Visitor and Brick Lane – I hear it might be a rainy weekend. Enjoy your mysteries. Oooh, I really liked Lush Life! Unfortunately, or fortunately, depending on how you look at it, I won’t be reading much this weekend. We are traveling right now, golfing, and visiting with family. I bet I’ve read ten pages over the last two or three days. Then next week is the kids’ Book Fair, so I won’t get much done then either. I’ll be back in business by the beginning of October! I am sorry I can’t see the library books. I am too distracted by the piles of books behind them. Oh my! You’re ambitious. I limit myself to one book a week…which, yes, sometimes is very limiting! I bought “The Hunger Games” yesterday, finally, finally, ready to read it for this weekend. Of course I’ve got like five chapters left and it’s only been 16 hours since I bought it. So much for that plan! I should use the library more. I don’t read as much as you though, so I feel pretty comfortable buying a booka week. What fun! I see lots more stacks in the background of that photo 😉 I love the mug. Have good weekend! I’m looking for a mystery book for my f2f group for next year. Can’t wait to hear what you think about Lush Life. This weekend I am planning on reading Murder, She Wrote: Panning for Pleasure. I really need an easy and enjoyable mystery to read this weekend after a long work week and these books are so perfect. Short, light, and always fun! Juliann – I hope you’ll enjoy Olive Kitteridge. I’ve got that one waiting for me. I keep hearing such great things about it too! Have fun watching movies. I wish we could do some of that this weekend too but I don’t think we’ll get a chance! Veens – It’s so cute isn’t it? I’ve got a throw pillow with the same design too. Sandy – I know the feeling. We’ve got family in town this weekend and maybe next weekend. It’s going to be crazy. Have fun with your family and good luck with the school book fair! Can’t wait to hear about that. Tamara – I’ll tell you a secret, I usually return books back unread or have to check ’em out several times! 🙂 I take it you are enjoying Hunger Games! I really want to read them one. Have fun finishing it. Stefanie – Yea, those are more unreads. Yikes. But after three months of no library books I had to go back 🙂 Have a good one! Melanie – I hope you find a good one. Mine is nice although the only thing I don’t like is that sometimes we’ll read series books out of order and I’m such a stickler for starting at the beginning. It’s nice to talk books f2f with peeps though so I go. That is the coolest photo! I love it!! I’m reading several books – no mysteries, but I just posted a self-interview about a cozy mystery, last night (Bundle of Trouble by Diana Orgain). I’m going to start To Serve Them All My Days by R. F. Delderfield and Evenings at the Argentine Club, soon. And, I read an RIP IV book that I need to review: House of Dark Shadows by Robert Liparulo (very fun YA — just creepy enough without being horrifying or gross). Have a terrific weekend, Iliana! 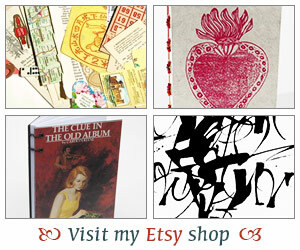 Trying desperately to make a dent in my stacks as well! I think I’m going to finish and review Royal Blood this weekend, and I might, just might, get started on another. Good luck! That mug is awesome 😀 Happy reading, and have a great weekend! I just started The Little Sleep by Paul Tremblay. Mark Genevich is a private eye in South Boston who has narcolepsy and can’t drive, so his mother drives him around in clown pants. It’s a funny take on the hardboiled noir and though it isn’t a great book, it’s a real fun read. Oh, and the author is a friend of a friend. I’m curious to read your reaction to Lush Life. I’ve yet to read any of Price’s stuff. 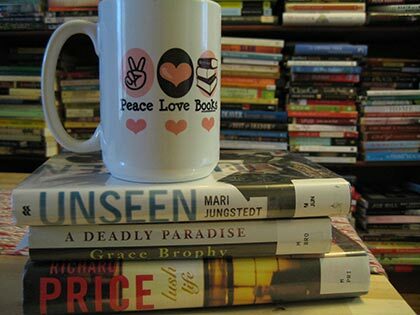 I got a few goodies at the library this week too, but don’t have a cool mug like yours!! Oops, I forgot to link to my new blog address…darn it! Hello Iliana, Still working on “Drood”. What a long book!!! Lots of repetition but I am enjoying the narrative. I am learning a lot about Dickens and Collins and the London’s underground life. Chilling! I have started “The Quickening Maze” by Adam Fouls. Good to have a dictionary on hand for this one. Lots of new vocabulary words for me to learn (splay, heath, pith… and I am only on page 30. I think that I am going to like it. Just got “The Year of the Flood” by Margaret Atwood. I will need to read “Oryx and Crake” before I tackle this one though. Enjoy your weekend. I like your tags. Makes me wonder what you are going to do with those. Bookmarks? Gift tags for Christmas presents? I did get a book at the library called: “Creative Quilts: Inspiration, Texture and Stitch” by Sandra Meech. She has used a well known approaches in Design classes and applied those for journaling, creativity and inspiration exercises to then translate into fabric. A lot can be done with this book. Can’t wait to practice some of those ideas. Until later. I’ve been taking a little breather from the library as well, but I have three books and two DVDs waiting for me at the moment! I hope you enjoy Mari Jungstedt. I’ve read two of her msyteries now and thought they were pretty good. At the moment I’m reading the first Frank Tallis book set in early 1900s Vienna and enjoying it very much! Have a great weekend! Haha, I was wondering if those were your TBR books back there. No new mysteries lately, although I think I may be in the mood for one soon. Right now I’m reading Tears of the Desert, a memoir of surviving Darfur. Have a good weekend, Iliana! Where did you get that mug? It is so cute (and I’m a sucker for reading-related mugs, I have quite a little collection). Being in a library 5 days a week, I have to stop myself from taking home too many books. It can be overwhelming sometimes, like a kid in a candy store! Right now the books I’ve checked out include Dragonfly in Amber (the second in the Outlander series), Gone with the Wind (a book I’ve been meaning to read for ages), and The Gargoyle (one of my RIP Challenge selections). I LOVE this picture! and of course tried to read the titles on some of them. Ah, the life of book lovers, eh? Mystery series? Well, I just finished Charlaine Harris’s first Sookie Stack house novel…not really mystery, more what? fantasy? ya know, modern vampires but the first one is a mystery, too. Also, I’m enjoying Victoria Thompson’s Gaslight series wiht each mystery taking place in thrun of the century NYC. Easy. Interesting. I like ’em. I’ve been in the mood for a good mystery lately and yours is the 2nd post I’ve come across regarding mysteries. These all look good so I’ll be waiting to hear your thoughts. LUSH LIFE is a great book, but not a fast read by any means. Lots of stuff going on there. I’m reading Bryan Gruley’s STARVATION LAKE, a first novel about a newspaper guy who plays hockey. He leaves the Detroit News in disgrace, goes back home to northern MIchigan to be editor of his smalltown paper and gets caught up in the death of his former hockey coach. Pretty good read, so far. It’s going slowly, though, because I’m working on my third tattoo shop mystery and that’s taken on a life of its own and pushed a lot of reading aside right now. love the mug! happy reading 🙂 I’m reading Your Heart Belongs to Me by Koontz. Ooh, I just went back to the library after a long time as well, though I didn’t have a ban! I need to finish the Support Your Local Library Challenge before the end of the year. Yayyy for returning to the ‘brary! I’m absolutely in love with mine now that I’m in the Richardson system and not out in the sticks!